Columbus is the second largest city and county seat of Cherokee County, Kansas, United States. 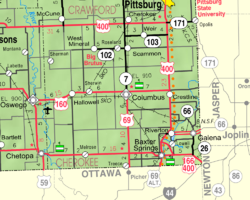 It is located approximately 15 miles south-southwest of Pittsburg. As of the 2010 census, the city population was 3,312. The first settlement was made at Columbus in 1868. The first post office in Columbus was established in 1869. Columbus was a railroad junction for the Saint Louis and San Francisco, and the Missouri, Kansas, and Texas railroads. It was named Columbus by A.L. Peters, one of the European-American founders, for his hometown of Columbus, Ohio; the name thus indirectly honors Christopher Columbus, the explorer. Coal, lead and zinc were mined in the region. Columbus had a considerable trade in agricultural products, and its businesses included machine shops, grain elevators, flour mills, a cigar factory, bottle works (soft drinks), a canning factory, and an extensive brick-making plant. In 1875, Robert A. Long and Victor Bell formed the Long-Bell Lumber Company in Columbus. From one lumberyard, Long-Bell expanded operations and holdings to become one of the largest vertically integrated lumber companies in the United States. In 1956 it was purchased by International Paper. Columbus is located at 37°10′17″N 94°50′27″W﻿ / ﻿37.17139°N 94.84083°W﻿ / 37.17139; -94.84083 (37.171379, -94.840704). According to the United States Census Bureau, the city has a total area of 2.42 square miles (6.27 km2), all of it land. The climate in this area is characterized by hot, humid summers and generally mild to cool winters. According to the Köppen Climate Classification system, Columbus has a humid subtropical climate, abbreviated "Cfa" on climate maps. As of the census of 2010, there were 3,312 people, 1,424 households, and 850 families residing in the city. The population density was 1,368.6 inhabitants per square mile (528.4/km2). There were 1,633 housing units at an average density of 674.8 per square mile (260.5/km2). The racial makeup of the city was 92.9% White, 0.5% African American, 2.7% Native American, 0.3% Asian, 0.4% from other races, and 3.3% from two or more races. Hispanic or Latino of any race were 2.1% of the population. There were 1,424 households of which 30.3% had children under the age of 18 living with them, 42.1% were married couples living together, 13.6% had a female householder with no husband present, 4.1% had a male householder with no wife present, and 40.3% were non-families. 34.9% of all households were made up of individuals and 19.3% had someone living alone who was 65 years of age or older. The average household size was 2.29 and the average family size was 2.94. The median age in the city was 39.1 years. 25% of residents were under the age of 18; 8.9% were between the ages of 18 and 24; 22.6% were from 25 to 44; 23.8% were from 45 to 64; and 19.7% were 65 years of age or older. The gender makeup of the city was 46.4% male and 53.6% female. As of the census of 2000, there were 3,396 people, 1,412 households, and 885 families residing in the city. The population density was 1,408.6 people per square mile (544.1/km²). There were 1,610 housing units at an average density of 667.8 per square mile (257.9/km²). The racial makeup of the city was 94.70% White, 0.32% African American, 1.56% Native American, 0.41% Asian, 0.77% from other races, and 2.24% from two or more races. Hispanic or Latino of any race were 2.03% of the population. There were 1,412 households out of which 29.7% had children under the age of 18 living with them, 47.5% were married couples living together, 11.3% had a female householder with no husband present, and 37.3% were non-families. 34.5% of all households were made up of individuals and 18.7% had someone living alone who was 65 years of age or older. The average household size was 2.30 and the average family size was 2.94. In the city, the population was spread out with 26.3% under the age of 18, 8.4% from 18 to 24, 24.3% from 25 to 44, 20.7% from 45 to 64, and 20.3% who were 65 years of age or older. The median age was 38 years. For every 100 females, there were 82.1 males. For every 100 females age 18 and over, there were 78.1 males. The median income for a household in the city was $27,530, and the median income for a family was $38,136. Males had a median income of $30,541 versus $17,069 for females. The per capita income for the city was $14,937. About 12.2% of families and 16.2% of the population were below the poverty line, including 23.1% of those under age 18 and 8.3% of those age 65 or over. Thomas Daniel Winter, US Representative from Kansas, 1939-1947. ^ "Columbus Chamber of Commerce". Columbus Chamber of Commerce. Archived from the original on July 22, 2012. Retrieved August 17, 2012. ^ Blackmar, Frank Wilson (1912). Kansas: A Cyclopedia of State History, Embracing Events, Institutions, Industries, Counties, Cities, Towns, Prominent Persons, Etc. Standard Publishing Company. p. 391. ^ United States Census Bureau. "Census of Population and Housing". Archived from the original on May 12, 2015. Retrieved February 15, 2014. ^ "Annual Estimates of the Resident Population: April 1, 2010 to July 1, 2012". Retrieved February 15, 2014. Wikimedia Commons has media related to Columbus, Kansas. Wikisource has the text of a 1905 New International Encyclopedia article about Columbus, Kansas. This page was last edited on 23 March 2019, at 15:36 (UTC).